1981 Plymouth. Photo from the D.C. Logan Collection. The 1981 Plymouth Gran Fury Pursuit was cheapened up a bit compared to the 1980 model. The gold brocade upholstery was replaced with a heavy plaid fabric and there were no power windows or power door locks as on the cars of the preceding several years. The only V-8 engine available for 1981 was the 318-4V teamed with a 3-speed automatic transmission. They worked far better than the 1980 version, but the performance was still less than exciting. The MSP will often test new products before purchasing in large quantities. 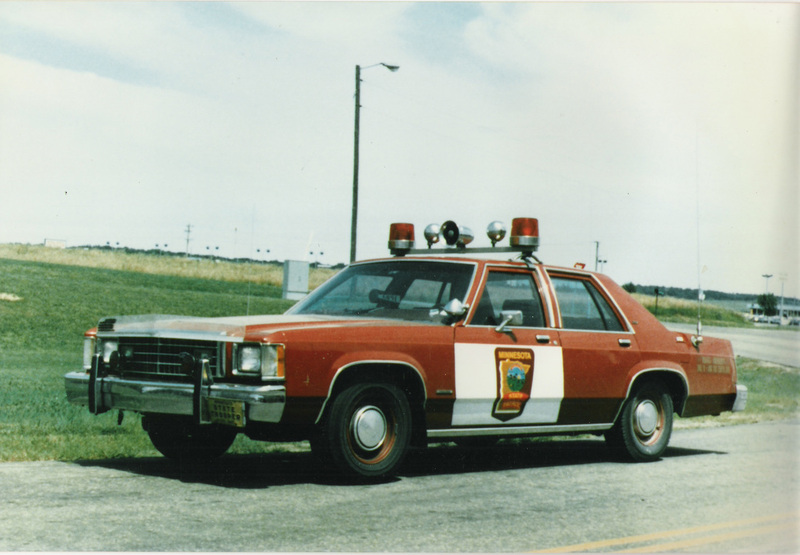 The light bar on this 1981 Plymouth was probably one such item. It's believed to be a Code 3 XL light bar. Most units were equipped with the Federal Visibar into the mid-eighties. Ford equipped the Interceptor with an optional 351 CID V8 w/Variable Venturi carburetor and the first automatic overdrive transmissions. The Patrol’s first Fords since 1969, their new automatic overdrive transmissions were problematic. Hopes were high that they would be good performers, but with 2.91 gears, they couldn’t maintain top speed in overdrive. Orders were given to avoid using overdrive during patrol duties. Although they were quiet and smooth riding, the handling characteristics could best be described as numb and vague. 1982 Ford LTD S. Photo provided by K. Mauston. 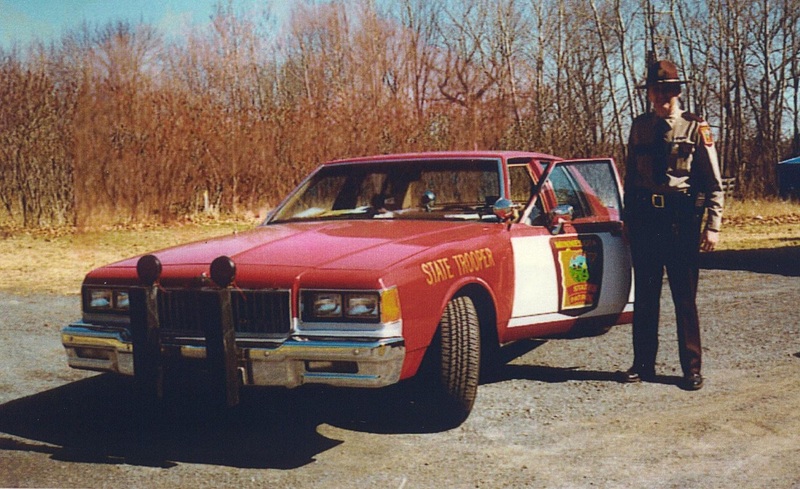 Troopers T. Murphy and J. Mock with a 1983 Plymouth. 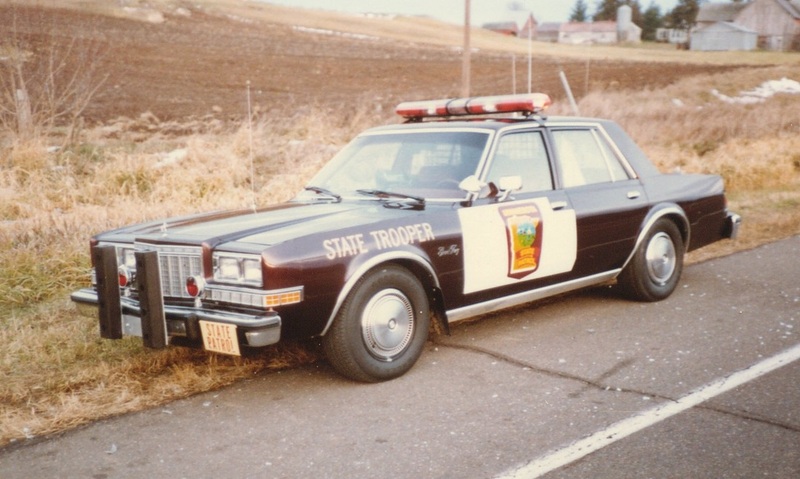 The 1983 Plymouth Gran Fury was considerably smaller than anything the State Patrol had used in recent years. Equipped with a 318 V-8 and Carter Thermoquad carburetor, the units performed respectably for their time. They had a stiff suspension that allowed for nimble handling. Motor Trend magazine described the car’s road feel as being able to “detect every chuckhole, tar strip, and paperclip” on the road. 1983 Oldsmobile. Photo from the T.B. Smith Collection. Running a 307 CID V8 equipped with an electronically controlled E4ME 4-barrel carburetor, rated at 140 hp and 255 lb-ft of torque, the Custom Cruiser was not really built for pursuit purposes. But, Oldsmobile offered heavy duty cooling, suspension parts, and a high output alternator that helped them survive the rigors of patrol use. 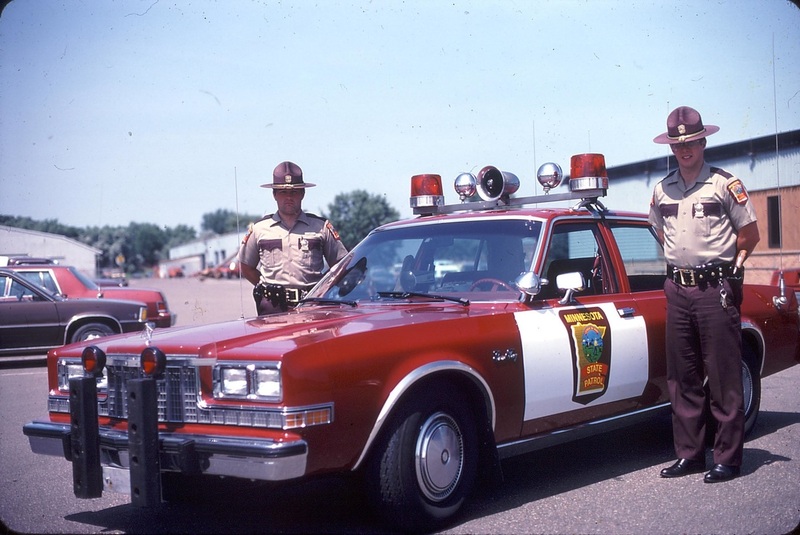 There were just a few of these Oldsmobiles in service with the MSP, all of them assigned to Safety Education Officers. The 1984 Ford Crown Victoria used the 5.8 liter V-8 with variable venturi carburetor. The specifications for the units included color-keyed wheels. They were delivered to the dealer with black wheels. To meet the terms of the contract, aftermarket wheel covers were selected in lieu of painting all the wheels. The 1984 Crown Victorias were outfitted with a cluster of gauges mounted in the dash above the glove box to monitor vital engine conditions. 1984 Ford with JetSonic light bar. Photo from the T.B. Smith Collection. 1985 Ford with JetSonic light bar. T.B. Smith Collection. The 1985 Ford Crown Victoria could be differentiated from the 1984 model by the OEM wheel covers and the lack of gauges in the dash. The only other visible difference was the location of the horn button, which was now in the center of the steering wheel rather than on the end of the turn signal stalk. The drivetrain was the same as in 1984. The drivetrain in the 1986 Chevrolet Caprice included a "police only" 5.7 liter V-8, 4-bbl carburetor, TH700R4 transmission, 3.08:1 rear axle ratio, and F41 performance suspension, making for a very smooth yet road-hugging combination. It made the paint color a bit more bearable. The state bid price for the maroon (ok... red) units was $10,488 and unmarked units were slightly lower at $10,459. The difference was the cost of a spotlight. 1987 Chevrolet Caprice. Photo courtesy J. Moe. Mechanically, the 1987 Caprice differed little from the 1986 version. 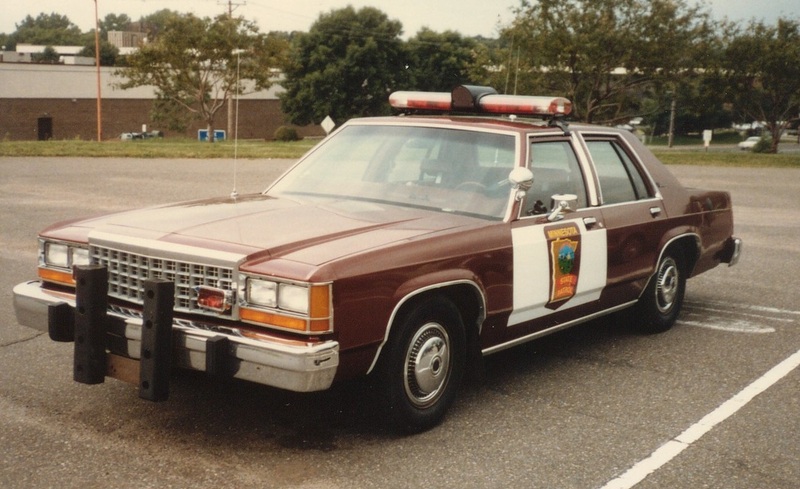 New for 1987 were the composite headlamps and more upscale burgundy cloth interior trim. And, the color was much better than the 1986 models. 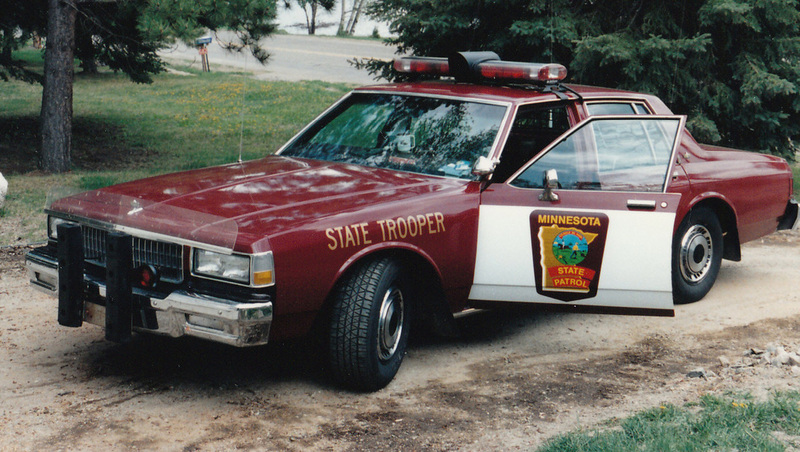 The 1988 Plymouth Gran Fury was the last of the Plymouths used by the Minnesota State Patrol. They were small, firm riding, agile handling cars. The drivetrain was nearly unchanged from that of the 1983 Gran Fury, except the 318 was now topped by a Rochester Quadrajet carburetor instead of the Carter carburetor of previous years. 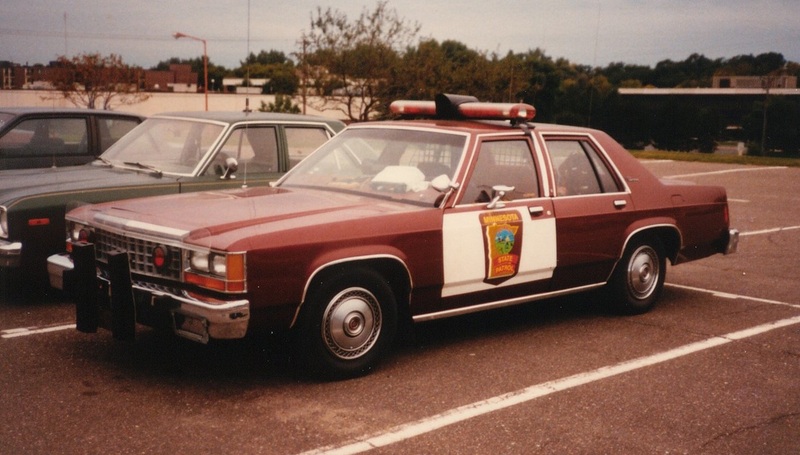 The unmarked 1988 Plymouths were among the first MSP cars equipped with airbags. 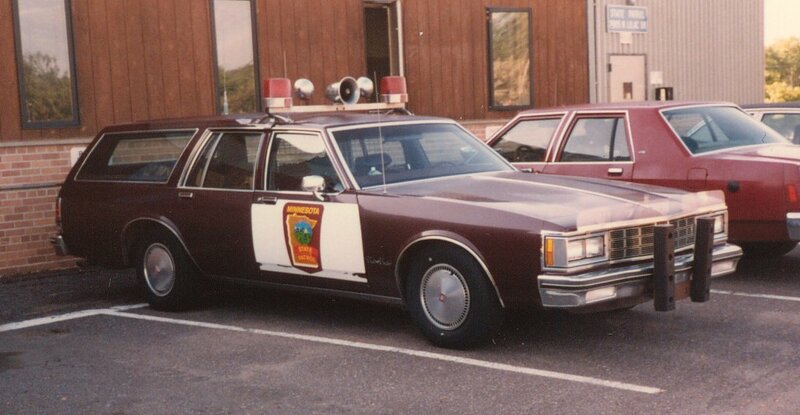 1988 Plymouth with JetStream light bar. T.B. Smith Collection. 1989 Chevrolet Caprice. Photo from the J. Moe Collection. 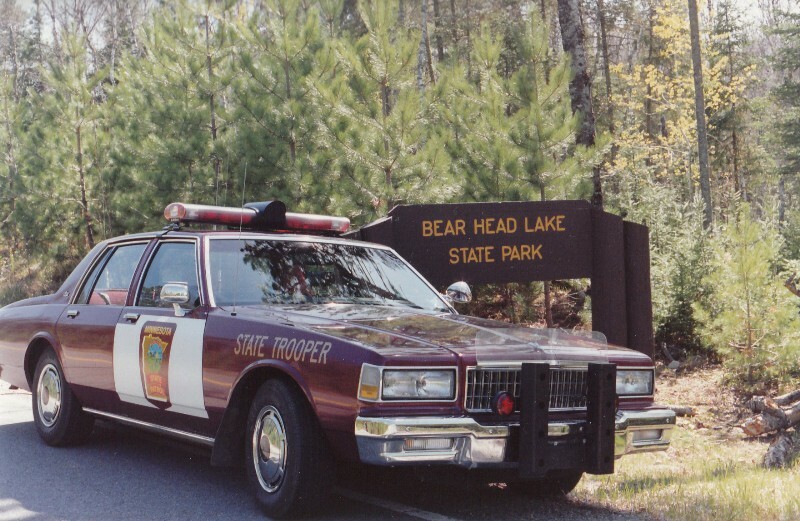 The 1989 Chevrolets were the first regular State Patrol units equipped with fuel injection. The 5.7 liter V-8 was now rated at 190 hp @ 4400 rpm and torque of 285 ft-lb at 2400 rpm. The 9C1 Police Package included the TH700R4 transmission and a 3.42:1 rear axle. The Caprice rode on a 116” wheelbase that offered a smooth, but firm ride, and great road manners. 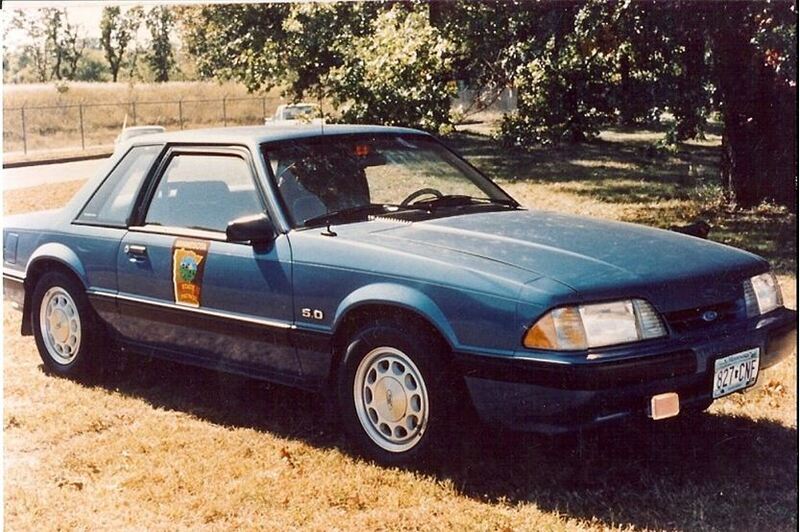 The Minnesota State Patrol purchased twenty Ford Mustang Police Package Coupes in 1989. These were all unmarked units that provided an inexpensive alternative to the traditional police sedan. They were equipped with the High Output 5.0 liter V-8 with automatic transmission. 1990 Chevrolet Caprice was changed little over the 1989 model. The 1990 Caprice was equipped with passive safety belts and the paint color changed again slightly, this time taking on a slightly brown hue. This was the first year some of the units were outfitted by a private vendor rather than MnDOT mechanics.